Recover My Files will find any type of deleted file. If your file is not listed in "File View" of the results screen, check "Folder View" or use the Filter button to filter search results. 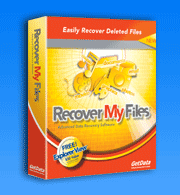 The following files types are specifically supported by Recover My Files Version 3.96. Please check the latest available version for an up to date file listing.